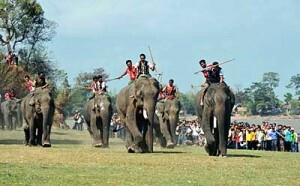 Some 20 t amed elephants in the Central Highlands region will compete in a race scheduled for March 12-14 in Krong Na commune, Buon Don district, Dak Lak province. They will show off their strength and skills in the running, football and swimming games. In furtherance of the event, there will be a range of traditional cultural activities of ethnic minorities such as new rice offering, buffalo sacrifice ceremony and gong performance. Visitors will have a chance to experience home-stay services in Buon Don and take part in trekking tours exploring jungles. Dak Lak province is dubbed as the home of tamed elephants whose number had declined sharply from 502 in 1985 to 84 in 2000 and fewer than 60 in 2010. In order to conserve its elephants, the province implemented a project worth 61 billion VND (3.1 million USD), under which a healthcare and research facility on elephant reproduction and conservation was established.